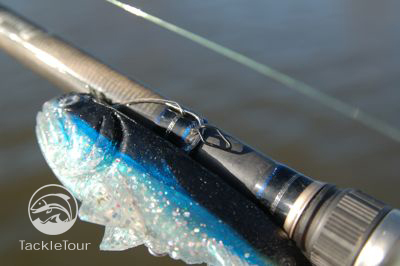 Introduction: When our Swimbait Rod Wars began, we decided to look at a wide range of sticks and while we originally planned to review the 800SBREH, we later took a look at the 765 CB/SBR which comes at us from the entire opposite end of the power spectrum from many of the other rods we have looked at so far and is a probable answer to the paddle-tail bait craze created by the shortage of Basstrix product over the past year and more. 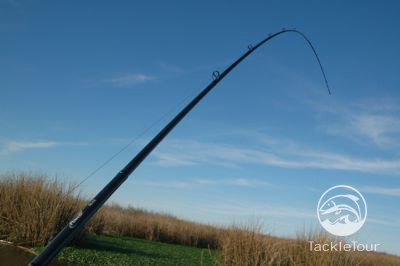 Length from Back of Reel Seat to Base 9.75"
Impressions: The Powell 765 CB/SBR is a one-piece, seven foot six inch stick with a normal, medium heavy (by line weight) to heavy (by lure weight) power specification. 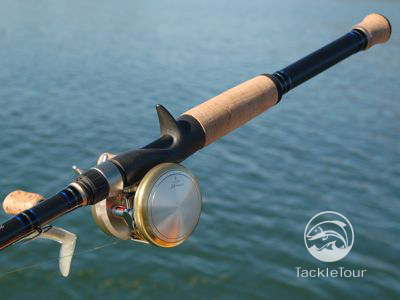 In fact, by holding the rod in hand and going over its lure and line weight ratings, it's difficult to think of this stick as a swimbait rod of any kind. That is, until you remember the paddletail bait craze that's dominated the bass fishing world over the past year to year and a half. 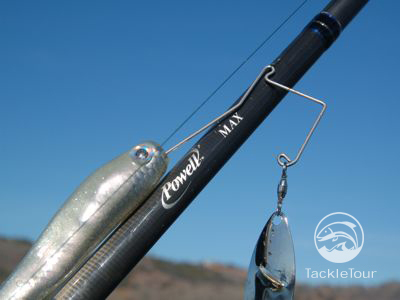 Lab Tests: If you've been keeping track of our Swimbait Rod Wars, you can probably guess without even looking at the chart that our 765 CB/SBR from Powell is the lightest powered stick of the bunch. That was our guess too, but we strapped it to our RoD WRACK in any case, so that we could chart the results against several other of our representatives. 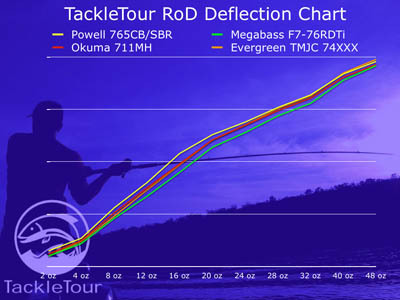 Rate of Deflection (RoD): As suspected, the Powell 765 CB/SBR did in fact test out lighter in power than any of our previous representatives from our Rod Wars especially under loads of 12 - 20 ounces. Before and after this range, the rod behaves very similar to the Okuma 711MH. Fig. 1 : This RoD Deflection Chart shows the deflection characteristics of the Powell 765 CB/SBR (yellow curve) against several similar sticks. Spine, Weight, and Balance Point: The Powell 765 CB/SBR comes in at a very svelte 5.1 ounces, the lightest of all our test rods, but also with a balance point that is eight and a half inches above the centerline of the reel seat. We located the stick's spine on its left side and can validate its factory rating of a mod-fast action. ... and a moderate-fast taper. Real World Test: So having gone through our lab tests and validating that this stick is indeed the lightest powered rod amongst our group of representatives, the question was, what to mount on it? How about an old classic with a few SuperTTuning touches like Daiwa Japan Millionaire CVZ 103L complete with an aftermarket adjustable sideplate, SiC bearings, a deep, ZPI Magnesium spool, and matching 85mm ZPI carbon handle with bearing supported cork knobs? 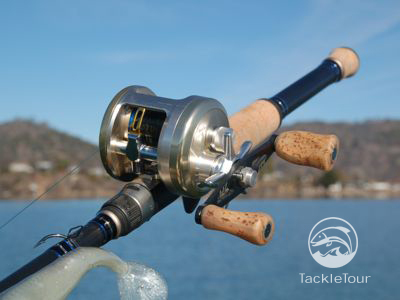 We spooled this reel with 70 yards of 19lb Sunline Defier and slipped the combo into our rod locker for some paddletail bait fun at Clear Lake and the California Delta. Pitching and Casting: The Powell 765 CB/SBR casts and pitches baits within its rated range very reminiscent of an old favorite of mine, the Kistler LTA He76MHC. The trouble is, it's difficult to consider baits that weigh only one quarter of an ounce to one full ounce true swimbaits. 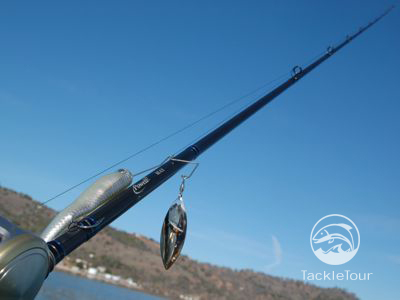 This is where we enter into the "finesse" side of this market segment, the paddletail baits. 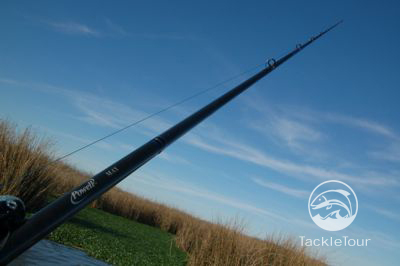 The open ended hook keeper on top of the blank is easily accessible from both sides of the rod. The 765 CB/SBR is a really nice long range spinnerbait stick. I used a variety of paddletail type baits with the 765 CB/SBR including the previously reviewed Rainbow Worms Bow Fish, the new Money Minnow (now owned and marketed by YUM), the Optimum Titan, and yes, I even managed to get my hands on some of the original Basstrix Paddletail Tubes that started this craze in the first place. The 765 CB/SBR presented all of them rather well.